I work in Tanjong Pagar and after almost 5 years there, I have my little red book for all the eateries in the vincinity. When mentioned Tanjong Pagar Plaza, most people would probably know that there's a very popular muffin shop there. However, just along the same stretch at the far corner, there's a less well-known shop selling soya bean milk and egg tarts, which is fast becoming a popular tea-time buy for my office. Honestly, I think that the famous muffins are a little too over-rated but I guess everyone's entitled to their own taste-buds. 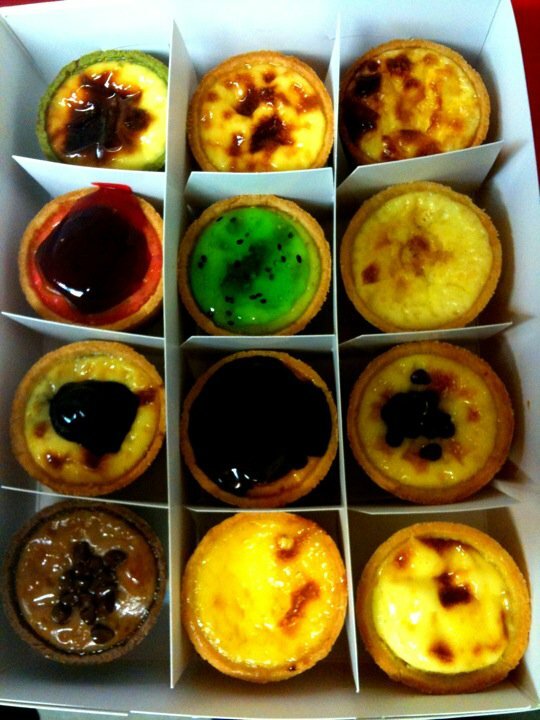 I didn't count but I think they have about 12 different types of egg tarts, both sweet and savoury. To name a few: Original, green tea, portuguese, blueberry, strawberry, kiwi, chocolate, double chocolate, cheese, pepper chicken and mushroom chicken. I'm not too adventurous when it comes to egg tarts so I pretty much still prefers the original egg tarts and for the savoury option, I would choose the cream cheese egg tart. Both the mushroom and black pepper chicken egg tarts do make for a more filling snack though. So next time when you are in the area, go check out this shop which is located along the same stretch as the muffin shop (you can't miss the queue) and interestingly enough, right next to a Jap adult store!